The Micro Eco-Farming book by Barbara Berst Adams (subtitled: Prospering from Backyard to Small Acreage in Partnership with the Earth) was released just as the backyard and local small-plot eco-farm resurgence was taking hold, but still beneath the radar. It was written for those looking to earn at least a partial stream of income from their mini-farm (vs. a “homesteader” who produces only for their own personal needs). It was not written to be a technical how-to, but rather to introduce a coming trend. It doesn’t give step-by-step instructions on digging a fence post hole or sawing wood for raised bed siding. In most regions of the US, the agricultural and master gardening extension services provide all of that information already, and often for free and customized to each climate. There is no "one type of farm" that all farmers across the country can mimic from a manual, and this book reveals just how diverse they all are, and all must be. 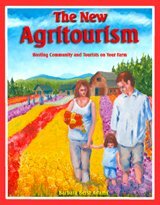 Since the micro eco-farming book, the author also wrote a longer, larger and more in-depth eco-farming book entitled The New Agritourism: Hosting Community & Tourists on Your Farm.